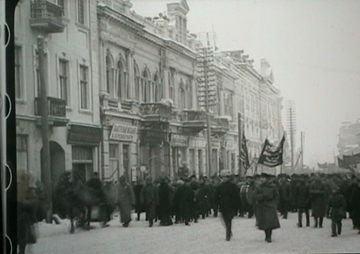 Protest Demonstrators Take to the Streets in Kino-Nedelia 35 — the initial newsreel norms of Kino-Nedilia, the series born of the pre-revolution production structures in 1919. Malitsky’s take on propaganda is to turn to the concept of the “social imaginary” as a key. As described by Charles Taylor this is, in essence, “the ways people imagine their social existence” which collectively determine “the repertory of collective action.” These understandings are made virtual through representations — and, so, the cinema comes to be a key facilitator of them. 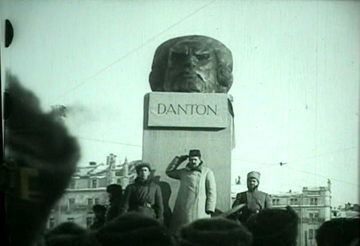 Dedicating a monument to Danton, Kino-Nedilia 34: In the first moments of revolution Vertov found work in the newsreel, learning his trade in the Kino-Nedilia offices. “None of the distinctions now familiar to producers and viewers of documentaries were in place at the time Vertov began to make films.” So, without prejudice to the fact that these “familiar” “distinctions” scarce hold up, Malitsky more specifically rejects that received opinion which sees the newsreel work of Vertov and Alvarez as being merely a preparation for their documentaries. Family reunited with a returning brigadista in Historia de una batalla: In effect the Cuban filmmakers were attempting to prefigure Anderson’s modernist concept of the nation as an “imagined political community,” one that is both stable but promotes change. 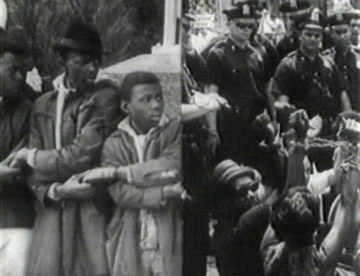 Nonfiction film’s further post-revolution task was also to facilitate the coming of “ideology to consciousness.” The ambition of governments and filmmakers throughout was to transform the citizen’s understanding of their individual roles as productive workers in the service of the revolution. From the masthead 6th Part: A Sixth Part of the World did not address the mandate to sell Russian products to the world. Moreover, the intellectuals of the LEF group were largely unimpressed. Viktor Shlovsky, for example, attacked A Sixth Part of the World claiming Vertov had filmed objects as a “curiosity, an anecdote, and not as a fact.” Vertov had no script, went over budget, and his fate as a Moscow filmmaker was sealed. 79 Spring Times of Ho Chi Minh. Joshua Malitsky, Post-Revolution Nonfiction Film: Building the Soviet and Cuban Nations (Bloomington: Indiana University Press, 2013). 274 pages. The parallels between Soviet and Cuban non-fiction cinemas in the immediate post-revolution period have been noted before but seldom with such comprehensiveness and insight as Josh Malitsky deploys in Post-Revolution Nonfiction Film. He is concerned with the period from 1917-1928 in Russia and from 1959-1974 in Cuba. Usually the epithet “revolutionary” is used of all the films made under the auspices of the newly-installed governments of 1917 and 1959. Malitsky, however, makes a distinction by isolating the titles, by no means all of them, that were revolutionary not only in ideology and intention but also in form. Hence Post-Revolution rather than Revolutionary film. In fact, Malitsky makes a useful tripartite division of output during these years to see “revolutionary” film qua film as dominating only the middle phase. It is the meat (as it were) in the sandwich of “post-revolution” cinema. The ambition of governments and filmmakers throughout was to transform the citizen’s understanding of their individual roles as productive workers in the service of the revolution, but the filmmaking strategies deployed changed through time. In both countries, the films he discusses as being revolutionary in both form and content are the product of what might be called a middle, experimental, “revolutionary aesthetic phase” (1922-1927, 1965-1971). These sought a film-form that, as Malitsky sums it up, “manifested new non-fiction cinematic languages.” [open endnotes in new window] This productive search followed an initial post-revolutionary “immediate realist phase” that used, for the most part, established newsreel techniques (1917-1921, 1959-1965). And it preceded a “revived realist phase” (1927-1928, 1972-1974)—in effect, a reaction to the failures of the revolutionary aesthetic as effective communication. Although these divisions, as Malitsky admits, are somewhat “permeable,” nevertheless they do powerfully unpin the case for Soviet/Cuban parallelism. The Russian developments were echoed across the world forty-years later in Cuba. 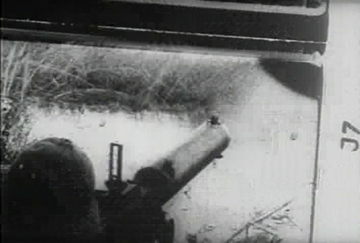 In both countries the pre-existing newsreel production capacity was harnessed to the revolution. In Cuba this involved total immediate nationalization, with the founding of ICAIC as the first cultural act of the new government. 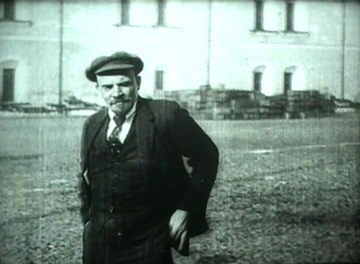 Lenin took longer: production facilities were taken over immediately, but full nationalization of distribution and exhibition waited until the foundation of Goskino in 1922. The importance of film to the state’s revolutionary agenda, however, was the same as in Cuba. 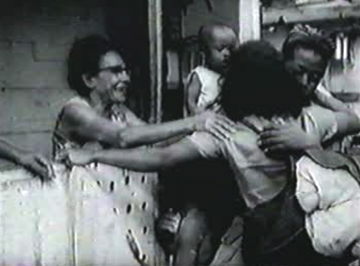 The initial newsreel norms of Kino-Nedilia, the series born of the pre-revolution production structures in 1919, are matched by a similar adherence to realist procedures in Noticiero Latinoamericano (1960-on). This gives way to the revolutionary aesthetic phase of the middle period, wherein avant-garde Soviet documentaries are echoed by the Cuban films, which consolidated the emerging international reputation of its cinema. Then reaction against this led to parallel returns in each county to realistic reportage and archival compilations. Post-Revolution Nonfiction Film convincingly lays out the argument to sustain this interpretation. The book necessarily sees Santiago Alvarez as a central figure in all these phases of the Cuban post-revolution cinema. Alvarez was a television professional (on the audio-side) at the moment of revolution and he was among the founders of ICAIC. He personally benefited from the support of Joris Ivens and Chris Marker as he retooled as a filmmaker, which he did so successfully that he was given charge of the weekly Noticiero from its inception. Some of this work, notably the newsreel roundup Ciclón/Hurricane (1963), first brought him to the attention of the outside world. Los Quatro Puentes/The Four Bridges (1974), 74 minutes on the Non-Aligned Nations meeting he attended in Algeria in 1973. Alvarez is often presented, with some justice, as a figure occupying similar ground to that dominated by Vertov in the Soviet Union four decades earlier. 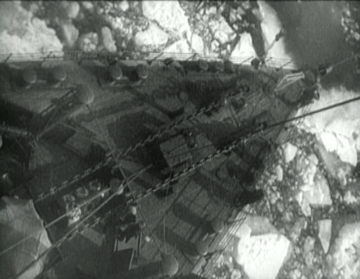 Malitsky’s tripartite division, though, highlights Vertov’s virtual disappearance during the third phase, after his experimentalism occasioned his dismissal from Goskino. This does not mean that, for Malitsky, the parallel breaks down. Instead, and most welcomely, he suggests that Alvarez’s role in turning away from avant-garde excess was played in the USSR by Esfir Shub. His pattern thus holds good. This is not to deny Vertov’s dominance during the experimental phase. Like Alvarez, in the first moments of revolution Vertov had found work in the newsreel, learning his trade in the Kino-Nedilia offices. As that series ran down in 1919, he emerged as a skilled newsreel director. 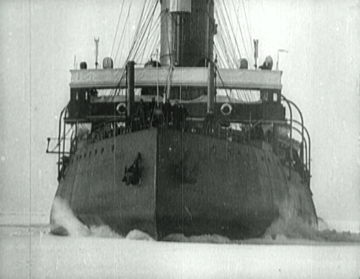 In Red Star (1919), he documented the voyage of the Red Star Literary-Instructional Steamer of the Central Committee down the Volga. Subsequently there was parallel film-work in connection with the Agit-Train mobile cinema initiative (Agit-Train of the Central Committee) as well as coverage of the civil war. By 1922, Vertov was ready to take the next step into more complex revolutionary experiments. “WE proclaim the old films based on the romance theatrical films and the like to be leprous. Keep your eyes off them! The “kino-eye” embraced the work of filmmaking itself with, for the first time, shots of Vertov’s wife, Elizaveta Svilova, at work in the cutting room. Deconstructions—fast and slow motion, super-impositions, split-screens, extreme close-ups—did indeed penetrate surface reality in the name of revolution. The work of bread-making, for example, is marvelously conveyed by simple dint of reversing the process so that the sequence concludes with the laborious replacement of the wheat-stalks in the ground. For the Lumières, reassembling a wall by reversing the film they took of its demolition was only a trick. 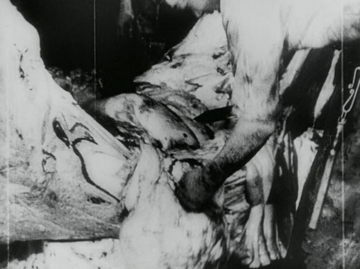 For Vertov, such tricks meant defamiliarization—ostranenei—in order to explain “the bourgeois structure of the world to the workers.” As with Alvarez, “communicating revolution experience” could not be achieved without such experiments. This, though, is not to make a “great man” point. Alvarez told Michael Chanan that he didn’t know Vertov’s work but he assumed that Vertov had adopted the same filmmaking agenda because the political situation demanded the same response. In Russia, the return to the norms of realism can be marked by Vertov’s sacking from Goskino in 1926 and the release of Esfir Shub’s pioneering historical compilation Fall of the House of Romanov in 1927. Vertov was in trouble by 1926: Stride, Soviet (aka Forward, Soviet) indicates why. One sequence documents an election rally in terms of machines, e.g. “attentive automobiles,” which are seen apparently “listening” and responding to each other. No citizens. No politicians. The commissars were not best pleased. Nor did the exhortative mode of A Sixth Part of the World, made in the same year, address the brief, which was to sell Russian products to the world (c.f. the British Empire Marketing Board’s ambition a few years later to use film to sell colonial products in the UK). Moreover, the intellectuals of the LEF groupwere also largely unimpressed. Viktor Shlovsky, for example, was to attack A Sixth Part of the World claiming Vertov had filmed objects as a “curiosity, an anecdote, and not as a fact.” More than all this, from Goskino’s point-of-view, Vertov never produced a full scenario—nor much of a plan. It was no surprise he went over budget on A Sixth Part… his fate as a Moscow filmmaker was sealed. It is much to Malitsky’s credit to here bring in Esfir Shub, as the dominant figure in the short third post-revolution phase of 1927-1928. University-educated and a figure in Moscow’s avant-garde circles, she had been Myerhold’s private secretary. She joined Goskino in 1922 to re-edit imported foreign films for the Soviet audience. 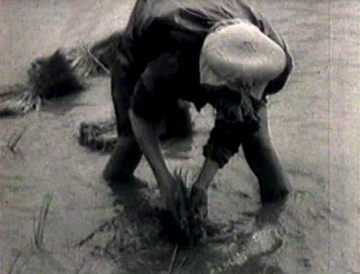 By the time of Vertov’s dismissal, newsreel production had fallen by 66%, but Shub was already at work in the archive engineering the return of accessible realism. Instead of the previously discussed Vertov/Alvarez binary, Malitisky therefore presents us with a triad: Alvarez is balanced by Vertov and Shub. This goes beyond recognizing Shub as a species of outlier: the pioneer of the compilation film. Without prejudice to the fecundity of this innovation for the documentary cinema in general, Malitsky places her compilation trilogy of these years—The Fall of the Romanov Dynasty, The Great War and The Russia of Nicolas II and Lev Tolstoy—as exemplifying the post-revolution’s third-phase. How audiences decode what they see and how they understand the integrity of the image vis-à-vis the referent is, of course, crucial. And it is what Vertov tackles head on and LEF thinking sidesteps. Is not this precisely Vertov’s intention in the previous phases? Be that as it may, the LEF circle’s critique of Vertov does not affect the validity of Maltisky’s periodization. What is perhaps more telling (but equally immaterial to Malitsky’s schema) is that, by any measure, Shub’s trilogy is superior to Alvarez’s recording of Castro’s speeches. So, overall, Malitsky’s dissection of the Russian and Cuban post-revolution non-fiction cinema is persuasive and valuable.